Happy Sunday! One full week of classes left!! I had a blast with the students who came with me to see “Charlie and the Chocolate Factory”! A special shout-out to all the teachers who helped chaperone. We had fun at Ellen’s Stardust Diner, walking around mid-town, and of course, at the show itself. I have added pictures on my website: www.roslynmschorus.org/photos . I have also included photos from SPOTLIGHT, the REVEAL CONCERT, and CONCERTS. If you have any photos you would like to share, please email them to me, and I will add them to our growing photo album. Some of you have already sent me some, so thank you! Below are just two picture from Friday. REMINDER: All projects are due JUNE 9TH. The project will be completed in class and outside of class. While students are completing the projects at home, we are also going to complete a study unit comparing “The Wizard of Oz” and “Wicked”. Students may turn in projects earlier. Congratulations to those who were accepted into Chorale for next year and to those accepted on the wait list. Please remind your child that it is an accomplishment to have auditioned at all. All students are expected to remain respectful and considerate, as the audition process is very sensitive. I have rubrics for all students who auditioned, and they are available upon request. The following are updates for Chorus, Chorale, and Spotlight. For those of you new to Weekly Updates, you can find previous newsletters on my website: www.roslynmschorus.org. If you would like to unsubscribe to these emails, please respond to this email with: “UNSUBSCRIBE”. You are automatically subscribed if you send an email regarding Chorus, Chorale, or Spotlight. 1. This week we will be meeting on MONDAY, WEDNESDAY, AND FRIDAY. 2. Please make a note that ALL students, 7th AND 8th grade, are required to sing at the 8th grade graduation on June 22nd at 11am at Hofstra. There will a bus that leaves from school. 3. As the school year is ending, attendance is very important!!! Please make sure you are coming to rehearsals on time and regularly so we sound terrific at graduation. 4. I was able to separate our concert audio from the video, so I will be making an album of these tracks for your enjoyment, rather than recording them live. 1. All projects are due June 9th, this Friday! If you have any questions please don’t hesitate to email or come during extra-help. 2. If you would like a copy of the concert, please send in a flash drive and I will put the recordings onto it. I can’t send the files because they are too big. 3. I will be sending chorus folders home this week, but if your child is registered for chorus next year, please save the folder since personal folders will be mandatory next year. As I mentioned last week, now that the concerts are over, all chorus classes will be spent completing group projects that are due JUNE 9TH. The project will be completed in class and outside of class. While students are completing the projects at home, we are also going to complete a study unit comparing “The Wizard of Oz” and “Wicked”. CHORALE AUDITIONS: This week auditions are Wednesday and Thursday. A sign-up sheet is outside my room on the whiteboard where I put announcements. Each student is going to receive a random number at their audition, and this Friday, after auditions, students will find out if they got in by their number to avoid embarrassment. As I mentioned at the meetings last week, because there is a large number of students auditioning, there will be soprano, alto and tenor/bass waitlists for those who do not initially get in. Next year, if a student drops from Chorale, I will take the first student on the waitlist for that section. Please have a fixed versus growth mindset conversation with your child this week to prepare students for the possibility that they may be placed on the waitlist. Rubrics will be used at the audition, and feedback will be given to any student who asks. Good luck! 1. This week we will be meeting on TUESDAY and THURSDAY. 3. Permission slips for “Charlie and the Chocolate Factory” have been sent home and were due last week. If I don’t have their permission slips as of tomorrow, they cannot go. We will have four teachers chaperoning, including our school nurse, and we will a lottery tomorrow morning at Chorale for parents who would like to go. Please respond to this email if you would like to be a parent chaperone, even if you have responded already! 4. We are going to record our songs from this year onto an album for your enjoyment! 1. Once again, congratulations on wonderful concerts! 3. Please ask your child about the projects that we are doing in class as they are a lot of fun! Congratulations to everyone who performed this week! A special shout out to all of our soloists, and our accompanists. I’m so proud of everyone for all their hard work! Now that the concerts are over, all chorus classes will be spent completing group projects. I’m attaching the assignment packet here. The project will be completed in class and outside of class. CHORALE AUDITION MEETING: This week from 2:45-3:00 on WednesdayAND 7:15-7:30am on Friday I will be holding a Chorale audition meeting for those interested. I will practice the warm-up scales and explain in more detail what will happen at the auditions. I will also distribute a rubric I will be using for auditions. REMINDER: Chorale auditions for NEXT year are going to happen the second week of June, after school. For the audition, students will need to be able to learn a harmony part on the spot from the song “Hallelujah” which I am also going to attach to this email. The students will also need to sing solfege scales which any child in chorus this year will know (Do-re-mi-fa-sol-la-ti-do-do-ti-la-sol-fa-mi-re-do, Do-mi-re-fa-mi-sol, etc., Do-mi-sol-mi-do, Do-fa-la-fa-do-la-do, Ti-re-fa-re-ti-sol-ti, do-mi-so-do-so-mi-do). This week we will be meeting on TUESDAY and THURSDAY. Please make a note that ALL students, 7th AND 8th grade, are required to sing at the 8th grade graduation on June 22nd at 11am at Hofstra. There will a bus that leaves from school. Permission slips for “Charlie and the Chocolate Factory” have been sent home with students. If your child doesn’t have a permission slip, make sure they stop by my room TOMORROW to receive one. Once I have all permission slips, I will be able to give out extra tickets to parents through a lottery system. We are going to record our songs from this year onto an album for your enjoyment! Congratulations on terrific concerts!!! All of our hard work paid off! If you would like a copy of the concert, please send in a flash drive and I will put the recordings onto it. I can’t send the files because they are too big. Please see the attached project packet for an idea of what we will be doing for the remainder of the year. Happy Mother’s Day to all who celebrate! Welcome to concert week! Monday will be 7th/8th grade, Wednesday will be 6th grade, and Thursday will be Chorale. It’s a busy week for those of you whose children are in multiple ensembles. See below for important updates. **Chorale audition sign-ups will begin this week for auditions starting on May 30th. For the audition, students will need to be able to learn a harmony part on the spot from the song “Hallelujah” which I am also going to attach to this email. The students will also need to sing solfege scales which any child in chorus this year will know (Do-re-mi-fa-sol-la-ti-do-do-ti-la-sol-fa-mi-re-do, Do-mi-re-fa-mi-sol, etc., Do-mi-sol-mi-do, Do-fa-la-fa-do-la-do, Ti-re-fa-re-ti-sol-ti, do-mi-so-do-so-mi-do). Black athletic leggings, ripped bottoms, athletic shoes. Our performers should look professional and formal to reflect our serious approach to music education. As always, teachers will be notified. Students will arrive at the HS on Thursday at 7pm in the chorus room wearing FORMAL black bottoms and white tops. Students should report to HS cafeteria no later than 7pm for a warm-up and to find their seats. I hope you enjoy our students performances this week! Our concerts are not this week, but the week after. As you can imagine, the next week and a half are going to be very hectic. This week begins our in school rehearsals. Please see the update section for a reminder of when those rehearsals are. For those of you interested in signing up your child for the ACDA Summer Chorus, the deadline has been extended to May 15th. Please let me know if you have any questions. I hope everyone had a relaxing weekend! NYSSMA is over, and we are on our way to concert season! Chorale auditions for NEXT year are going to happen the second week of June, after school. For the audition, students will need to be able to learn a harmony part on the spot and sing a scale on solfege. More details will be rolled out by next week. All solos in Chorale and Chorus will be announced this week. Shout out to Jack May who was great in the musical “Spelling Bee” over the weekend! For those students who participated in NYSSMA, I should have scores by Wednesday. I’ll make a morning announcement if I get them before that. 1. DVDS: Please tell your child to pick yours up if you ordered a DVD. I do not have any extras, but you can contact Merelis Video if you would like to purchase. I hope everyone is relaxing on the last few hours of vacation. I had a very relaxing break, but I’m ready to charge into concert season! NYSSMA is tomorrow and Thursday. If attending, please make sure you bring your child’s performance permit, something to play their (piano) accompaniment (iPods, phones + speakers, boomboxes), TWO copies of the original music, and water. I’m going to try to stop by for a few hours if I can! I haven’t had a chance to thank everyone involved with the Reveal Concert. Everyone did such a fantastic job! Thank you to Stacey Drucker and Erica Rubrum for selling tickets at the door. For those who did not attend, next year’s musical is Les Miserables! As always, you can check http://www.roslynmschorus.org for updates. Have a great THREE day week! 1. Like I mentioned above, everyone did a fantastic job during the Reveal concert! I’m so proud of everyone involved. 2. DVDS ARE IN!!! Please tell your child to pick yours up if you ordered a DVD. I do not have any extras, but you can contact Merelis Video if you would like to purchase. 1. This week we will be meeting on WEDNESDAY and THURSDAY. 1. All auditions for solos, all grades, will continue THIS WEEK ONLY. 4. Take-home quiz is due this week. 5. Please remind students to bring water and pencils to class. Congratulations to Andrew Defrin, Cary Drucker, Davey Fried, Lindsey Russ, Morgan Sapienza, and Gianna Segura for a fantastic performance in Bye Bye Birdie! I loved seeing it last night. NYSSMA is coming up after break! Please make sure you are practicing on your OWN, although you can come to me to practice as well. Dates/times are outside my room and NYSSMA permits have been printed. Please have your child come to me if they have no received their permit yet. Students MAY play accompaniments on an iPod with speakers for their evaluation or on a phone as long as it is on “Do Not Disturb Mode”. Also regarding NYSSMA, I will be doing “mock NYSSMA” sessions with students beginning this week until NYSSMA with mock score sheets. This MUST be scheduled ahead of time. Please tell your child to come to me for a time or email me. Our Reveal Concert is this week on April 5th at 3:30! We should have a full house, so get ready! As always, you can check http://www.roslynmschorus.org for previous Weekly Updates. One more week before your long deserved break! 1. DVDS ARE IN!!! Please tell your child to pick yours up if you ordered a DVD. I do not have any extras, but you can contact Merelis Video if you would like to purchase. 2. Students MUST bring a karaoke track to Reveal Concert rehearsals. If a student does not have a karaoke track on a CD, it will not count as a rehearsal. 3. This week will have two dress rehearsals AND the performance. Our dress rehearsals are Monday (2:45-4:00) and Tuesday (2:15-4:00). The Reveal Concert starts at 3:30, but students must be there at 2:45. Students MUST bring their CD if they have no given one to me yet. 4. Tickets should have gone home last week. If you need a ticket, please ask your child. Otherwise, they can be purchased at the door. It is first come, first serve seating. 5. The “reveal” song will feature me, Ms. Bellsey, Mr. Diercks, Ms. Schaffer, and Mr. Johanson, spread the word! 6. All performers must wear all black. Formal dress is encouraged as this is a performance. 7. I spoke with the track coaches, and they should be flexible with students missing practice for our concert, which is very generous of them! 2. Auditions for “Somewhere Over the Rainbow” and “First Trumpet Sounds” (the beginning part of both songs) are going to be this week BEFORE school on B days (7:15am). 3. We will be seeing “Charlie and the Chocolate Factory” on June 2nd, 8pm! Orchestra seats. The district is paying for the tickets! 1. All auditions for solos, all grades, will be this week and the week after vacation. 4. A take-home quiz has been distributed and it is due the week we come back from break. 5. Please remind students to bring water and pencils to class. I am taking off from participation grades for not coming to class with a pencil. Have a great last week before our long break!. I hope everyone had a relaxing weekend. Our Reveal Concert is rapidly approaching, as is vocal NYSSMA! This week will be a little hectic with state testing. Our Reveal Concert is in two weeks on April 5th at 3:30! It’s coming around the corner fairly quickly. Students should be practicing on their own time as well as with me. Shout out to Samara Yadegari, Max Rubrum, Steven Schwartz, and Tyler Turetsky for their creative choreography for their song. I have the NYSSMA times for all vocal students. Please tell your child to check the board for their time and date. I finally have the playing permits as well, so I will be distributing those beginning tomorrow. If your child is unsure of anything, please don’t hesitate to ask. 3. Some students have not come to any rehearsals yet. Remember that in order to be involved, students must come to 2 rehearsals and 2 dress rehearsals. 5. The “reveal” song will feature myself, Ms. Bellsey, Mr. Dierks, Ms. Schaffer, and Mr. Johanson, spread the word! 6. Reminder that this is happening April 5th at 3:30pm. 1. This week we will be meeting on MONDAY, TUESDAY, AND WEDNESDAY. 2. Auditions for “Somewhere Over the Rainbow” and “First Trumpet Sounds” (the beginning part of both songs) are going to be this week BEFORE school on B days (7:15am). I’ll explain at rehearsal tomorrow. 3. We will be seeing “Charlie and the Chocolate Factory” on June 2nd, 8pm! Orchestra seats. More to follow! 4. I know this week is state testing. If your child is unable to come on Wednesday morning, it’s completely understandable! However, I will be there for anyone who would like to come. 2. We are currently learning about sharps, flats, and key signatures. This is a very hard topic, and my students are doing very well! 3. Please remind students to bring water and pencils to class. I am taking off from participation grades for not coming to class with a pencil. Happy Monday and happy spring! I apologize for not sending this on Friday. Congratulations to all the piano NYSSMA students who performed their solos this weekend. I can’t wait to hear how they went. Thank you to the students who have been keeping me company during their lunch periods just to sing. We are having a blast 6th and 7th period, singing, dancing, etc. I’m really blessed to be in the company of such talented students. This is a reminder that the custodians have just installed a whiteboard outside my classroom where students can find announcements, schedules, sign-ups, etc. Please tell students to check the board regularly. This location will replace the area I previously posted updates which was outside the auditorium. I have the NYSSMA times for all vocal students. Playing permits are not allowed, but I will be posting the times for all students outside my room on the whiteboard. Please tell your child to check the board for their time starting tomorrow. As always, you can check www.roslynmschorus.org for any updates. 2. Reminder that students who would like to participate in the Reveal Concert should sign up for a time on the whiteboard outside my room. Students must attend 2 rehearsals in addition to the two dress rehearsals. Students participating should make a CD of their karaoke track and bring it with them to rehearsal. 3. Students who would like to help organize the prop closet should see me and come to a rehearsal time. 4. If students would like to help behind the scenes with programs, organization, etc., please tell them to come see me this week. 7. All students participating must sell 5 tickets in advance. 2. Auditions for “Somewhere Over the Rainbow” are going to happen the last week of March. 3. Thank you for sending me your conflicts. I will finalize the dates with Mr. Johanson and Mr. Lazarus ASAP. 4. We have the opportunity to go on a trip called American Young Voices along with students from Herricks Middle School. Your child will be receiving information about this, including dates and music, this week…it would have been last week but I was out on Friday. 2. Now that we have the Smartboard, I’m very excited to use technology in our lessons. Please ask your child about the new additions to our lessons. I hope everyone had a relaxing weekend. I hope this week is ok with the snow predicted for Tuesday! The chorus room now has a Smartboard!! We are so lucky. Students will be able to have a better understanding of their music now through interactive activities, media, and more! Shout-out to Jordyn Brandman (6th grade) who has been very helpful in class! NYSSMA is coming up. Please make sure your child schedules an appointment with me during extra-help if they need help with their song or with sight-singing. 1. Reminder that students who would like to participate in the Reveal Concert should sign up for a time on the whiteboard outside my room. Students must attend 2 rehearsals in addition to the two dress rehearsals. 2. Students participating should make a CD of their karaoke track and bring it with them to rehearsal. 4. We have the opportunity to go on a trip called American Young Voices along with students from Herricks Middle School. Your child will be receiving information about this, including dates and music, this week. 5. I am so so so proud of everyone’s hard work in “First Trumpet Sounds”…we’ve been chipping away at it since October and it sounds terrific now! 2. I’m looking forward to using the Smartboard this week in class. Now we can get a more in-depth look at accidentals and key signatures. 3. Please remind students to bring water and pencils to class. Beginning last week, I am taking off participation grades for not coming to class with a pencil. 4. Sixth grade has just added the song “Corner of the Sky” (a personal favorite) and 7th/8th grade has just added the song “Chasing Cars”. I hope everyone had a stress-free, first week back from vacation! **NEW** The custodians have just installed a whiteboard outside my classroom where students can find announcements, schedules, sign-ups, etc. Please tell students to check the board regularly. This location will replace the area I previously posted updates which was outside the auditorium. I hope everyone has an enjoyable week! 1. Now that we have had a few weeks to recuperate, we are on to TWO more Spotlight events: Organizing the prop closet and our Spotlight Goodbye, Reveal, and Fundraising Concert, which I’m going to shorten to be the “Reveal Concert”. – Students will sing ONE time on the stage, something from musical theater. They may perform solo, as a duet, trio, etc. but they may only appear on stage ONCE so we are not there all day. – Eighth graders will receive a goodbye gift from myself at the concert. – Students MUST provide their own karaoke track on a CD, as all singers will use karaoke. – The tentative date for this is April 5th at 3:00, although that may change by next week. – Tickets are $10, and will be sold at the door, first come, first serve. Cash only. All proceeds will go to Spotlight for next year. – The concert will culminate with myself singing a song from next year’s show to reveal what the show is. Students should come to the informational meeting this Wednesday for more details and to sign up. 3. Cleaning out the prop closet: While students are rehearsing for the Reveal Concert, students who are not rehearsing will be assisting with organizing the prop closet. Any student who is not performing is welcome to still help organize, especially students who work backstage so they know where everything is for next year! 1. This week Chorale will meet on Tuesday and Thursday. 2. Please stay tuned for details about the trip to see a Broadway show. Students will be sent home with information either this week or next week. 3. Shout out to Cary Drucker who played the trumpet for us in rehearsal last week for our song “First Trumpet Sounds”! He was fantastic. 1. Please remind your child to bring a pencil to class. Starting this week, students will be receiving a 1 point lower participation grade if they do not bring a pencil to class. 2. Please encourage your child to bring a water bottle to class. Many students need to leave for water mid-class because of all the singing, but we could have minimal distractions if more students brought water bottles. 4. This week 7/8th graders will begin to learn “Chasing Cars” which I have arranged for SAB, and 6th graders will begin to learn “Corner of the Sky” from Pippin. I hope everyone has a very musical week!! Congratulations on a successful run of The Sound of Music. I am so honored to have had the opportunity to work with everyone involved. I cannot wait for future performances and to see how my current 8th graders do as high schoolers in RCP! For those of you new to emails, you can find all previous newsletters on the website: www.roslynmschorus.org/newsletters. As always, please never hesitate to ask me anything. 2. Students can pick up their own copies of Break A Legs if they don’t have one already. 3. I have a small belt in my room that may belong to one of the boys. Please let me know if you are missing a belt. 4. We are going to have our reveal/fundraising concert in April. Stay posted for details. 1. We have been invited to sing with the Jets next school year! Current 8th graders are definitely invited to sing with us! We will miss you! 2. Rehearsals will be on MONDAY, WEDNESDAY, AND FRIDAY after the break, and begin at 7am. 3. I am looking into bringing the Chorale somewhere in the near future. Stay posted. 1. This week we had our chorus quiz on staff letter names and solfege. Grades have been posted on the portal and quizzes have been returned. If students need to make up the quiz, please come see me. Students may also take make up quizzes to replace low grades. 2. Starting on Monday after break, students MUST bring their own pencils. I am no longer loaning pencils. 3. Please encourage students to bring their own folders. 4. Please go to my website: www.roslynmschorus.org/chorus to find all all handouts, current repertoire, and online practice. Have a terrific long vacation!! You all deserve it! We made it! We are finally less than 1 week away from “The Sound of Music”!! I’m very excited, and I’m sure we have many anxious and excited kids at home as well. We are in very good shape. Please read ALL the updates below for Spotlight. I have just accepted the position as Division V Mixed Chorus All-County Chairperson. Hopefully I can better answer any All-County questions from now on! Shout out to Andrew Defrin and Davey Fried for taking the time to hang up signs around our school to advertise “The Sound of Music”! Reminder: The NYSSMA deadline has passed. Unfortunately it is too late to register at this point. If your child signed up for NYSSMA, they can schedule an appointment with me during extra-help to work on their solos. I will be hosting a NYSSMA meeting Wednesday, February 15th at 2:45pm that will last about 30 minutes to discuss procedures for NYSSMA and answer any questions you may have. As always, please never hesitate to ask me anything. I’m grateful to have such a supportive team of parents behind the choral program at the middle school! 2. Costume update: PLEASE CONTACT MRS. MADANI WITH ANY LAST MINUTE CONCERNS. Our FIRST dress rehearsal with costumes will be Monday. 4. You may still order tickets. Please send me an email and I can assist you. 5. I was talking to students about the tradition of “Break-a-legs” today. More details to follow on Sunday. 6. The videographer is coming for the Saturday production and the Sunday production. 7. Students are expected to come to school next week and are still expected to complete their homework. Students will not be excused from classes or schoolwork. 8. Please wear your T-Shirts as much as possible next week! 1. Chorale sounds outstanding on all of our new songs! 3. This week we are going to FINALLY get our Grease Medley. 4. We are going to record the Star Spangled Banner to send to a few places as well. 1. Our sixth graders have really come such a long way since the beginning of the year. We are singing in parts, singing with healthy vocal technique, and many of our students have really blossomed into incredible singers! 2. We have a chorus quiz this upcoming week that includes step/skip solfege and all staff letter names (bass AND treble). We are practicing each day at the beginning of each class. I’m also collecting, grading, and handing back all classwork to make sure each and every student is getting individualized feedback. LUNCH CHORUS does not take this quiz. 4. Please remind students to bring a sharpened pencil or pen to class. 5. Please go to my website: www.roslynmschorus.org/chorus to find all all handouts, current repertoire, and online practice. 6. Ask your child about any Do Now’s (bell work) they have received to make sure they are ready for their quiz. I’m so excited that we are 2 weeks away from “The Sound of Music”! The next two weeks will be stressful but very rewarding. Once again, we have a lot of updates this week, so please take the time to read through everything. Congratulations to Jack May who had a solo at All-County two weeks ago! We are very proud of him. Also, shout out to my 7th grade lunch chorus who is rocking “My Shot” from Hamilton during class. I can’t wait for the concert! ALL GIRLS must wear: black tights, black tank top, and black character shoes. 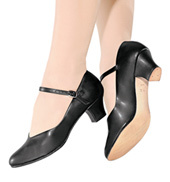 You can find them on Amazon or go to stores like Capezio. Character shoes have a special bottom that make them soft on the stage and easy to move in. Please invest in a pair if you haven’t already as students will need them for other shows in the future. MAKEUP: FOUNDATION, LIPSTICK, EYE SHADOW, BLUSH. Please provide your own makeup since sharing is not always caring when it comes to germs. HAIR: Unless Mrs. Madani has told you otherwise, hair should be either up or partially up since it will need to be able to fit under a habit and then be fine when you take it off. ALL BOYS: Black socks, not white…BLACK SOCKS and BLACK dress shoes. No sneakers! Shoes that would look like they belong in 1940. MAKEUP: FOUNDATION, LIPSTICK, NO EYE SHADOW, BLUSH. Yes…boys will be wearing makeup. Since the lights will be very bright, everyone’s faces will be drowned out. 4. If you haven’t already, please make sure your ticket order forms are done ASAP so you can guarantee seats for all of your guests. Ticket forms can be found on the website under “printable forms.” They can be returned to either myself or Friends of Spotlight. 5. The production team is asking for all parents and guardians to pick up their children on time. Rehearsals end promptly at 4:45. Both Ms. Bellsey and I live far away, and cannot leave until every child has been picked up. If you child is not picked up by 5:00 late bus. 7. Please make sure you are checking the website for calendar updates. All dates and times on the website are accurate. Additionally, tell your child to check outside the auditorium for updates and listen to morning and afternoon announcements. 8. T-Shirts are still available. Please make sure students wear them on FRIDAYS to advertise for our show. 9. I ordered about 200 posters to hang in store windows. They should be ready by the end of next week. 10. The videographer is coming for the Saturday production and the Sunday production. 11. Please refer to the makeup and costume tutorials I sent last week. All boys MUST wear makeup so they can be seen on stage. 12. Please have your child wear their T-Shirt next week as much as possible to advertise! 2. Rehearsals will be on TUESDAY AND THURSDAY next week and begin at 7am. 3. Thank you to Cary who is learning the trumpet part for our song “First Trumpet Sounds.” I’m so excited to perform that for our concert. 1. We have a chorus quiz the SECOND week of February (change in date!!) that includes step/skip solfege and all staff letter names (bass AND treble). We are practicing each day at the beginning of each class. I’m also collecting, grading, and handing back all classwork to make sure each and every student is getting individualized feedback. LUNCH CHORUS does not take this quiz. You can find them on Amazon or go to stores like Capezio. Character shoes have a special bottom that make them soft on the stage and easy to move in. Please invest in a pair if you haven’t already as students will need them for other shows in the future. 3. If you haven’t already, please make sure your ticket order forms are done ASAP so you can guarantee seats for all of your guests. Ticket forms can be found on the website under “printable forms.” They can be returned to either myself or Friends of Spotlight. ***TICKETS ARE BEING SOLD NEXT TUESDAY, WEDNESDAY, THURSDAY, AND FRIDAY DURING PERIODS 5, 6, AND 7. ************** $10 EACH. 4. The production team is asking for all parents and guardians to pick up their children on time. Rehearsals end promptly at 4:45. Both Ms. Bellsey and I live far away, and cannot leave until every child has been picked up. If you child is not picked up by 5:00 late bus. 6. Please make sure you are checking the website for calendar updates. All dates and times on the website are accurate. Additionally, tell your child to check outside the auditorium for updates and listen to morning and afternoon announcements. 7. T-Shirts are still available. Please make sure students wear them on FRIDAYS to advertise for our show. 8. I ordered about 200 posters to hang in store windows. They should be ready by the end of next week. Spotlight…we are one month away!! 1. Our students did a great job with the choreographer this week. While I was at All-County, our students worked extremely hard with Ms. Bellsey and our choreographer.